Keywords: NR3C1, HPA axis, Stress, Glucocorticoid receptor, Psychopathology, Methylation. Keywords:NR3C1, HPA axis, Stress, Glucocorticoid receptor, Psychopathology, Methylation. Abstract:Early life adversity is associated with both persistent disruptions in the hypothalamicpituitary- adrenal (HPA) axis and psychiatric symptoms. Glucocorticoid receptors (GRs), which are encoded by the NR3C1 gene, bind to cortisol and other glucocorticoids to create a negative feedback loop within the HPA axis to regulate the body’s neuroendocrine response to stress. Excess methylation of a promoter sequence within NR3C1 that attenuates GR expression, however, has been associated with both early life adversity and psychopathology. As critical regulators within the HPA axis, GRs and their epigenetic regulation may mediate the link between early life adversity and the onset of psychopathology. 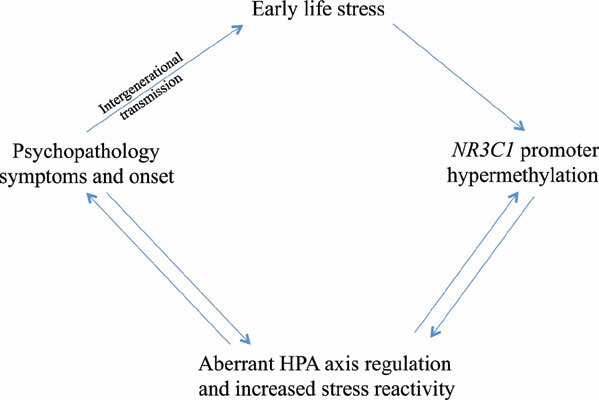 The present review discusses this work as one mechanism by which stress may get under the skin to disrupt HPA functioning at an epigenetic level and create long-lasting vulnerabilities in the stress regulatory system that subsequently predispose individuals to psychopathology. Spanning prenatal influences to critical periods of early life and adolescence, we detail the impact that early adversity has on GR expression, physiological responses to stress, and their implications for long-term stress management. We next propose a dual transmission hypothesis regarding both genomic and nongenomic mechanisms by which chronic and acute stress propagate through numerous generations. Lastly, we outline several directions for future research, including potential reversibility of methylation patterns and its functional implications, variation in behavior determined solely by NR3C1, and consensus on which specific promoter regions should be studied.